The total number of large superannuation funds shrank 72% over the last 10 years, according to Rice Warner’s latest Superannuation Market Projections Report, a trend that is likely to continue. 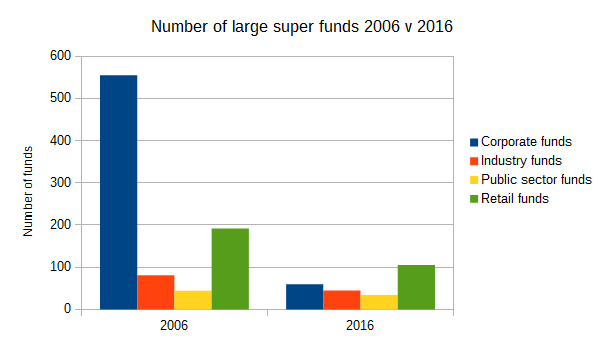 As at 30 June 2006 there were 872 large superannuation funds – excluding smaller funds, such as SMSFs. By 30 June 2016 this number had shrunk to 244. The bulk of this decrease was in the number of corporate funds, but all sectors shrank over the decade. “There are a number of significant and well documented forces shaping the superannuation industry– demographic shifts, rising member balances, technological changes and legislative evolution – but consolidation within the industry has and will continue to be one of the main driving forces that shapes the industry,” says Rice Warner. Rice Warner noted that APRA expects further consolidation in the superannuation sector and is looking for fund trustees to be proactive. Other research by Rice Warner indicates that the benefits of scale are a “major driver” in reducing costs for super funds. Super funds with over $10 billion in assets tend to have “materially” lower investment expenses compared to other funds. 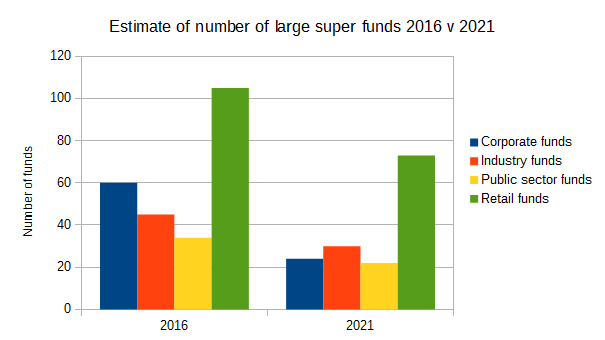 Rice Warner estimates that by June 2021 there will be 149 large superannuation funds, down almost 39% from current levels.